The aim of my Super Lean Regime is to get you into the best shape you can be: the Super Lean version of you. I want to help you to lose body fat (and weight) forever by helping you to improve your nutrition, exercise and lifestyle routines. using the secrets of the Super Lean. My Super Lean Regime is not about restrictions or dieting, it’s about fuelling your body, burning fat and building muscle to help you become lean, strong and healthy. All you need is between 20 – 45 minutes a day, 6 days a week and you’ll be able to benefit from the Super Lean Regime. The initial part of my Super Lean Regime will last 12 weeks and be split into three 4 week phases: Phase 2 builds on Phase 1 and Phase 3 builds on Phase 2. There after you will be able to incorporate it into your life and reap from the benefits the way I have (-24lbs. -9% body fat, low blood pressure, happy and healthy: see here for my journey). Nutrition: Eat a good balanced, healthy and nutritious diet. Time your nutrition well to promote fat burn and starve your fat stores. I’ll also be suggesting some good optional supplements to look out for and the ones to avoid. Cardio: Do Cardio Intervals three alternate days a week (Tu, Th, Sa). Cardio workouts will be short and intense and feature variation to achieve results. You choose the type of cardio you enjoy the most or mix it up with various types of cardio for more variation. Strength Training: Do Strength Workouts on other alternate days (Mo, We, Fr). Lifting heavy things in circuit format with limited rest to promote fat burn and formation of muscle to burn calories and look good. I will provide my ‘Body Shock Power Workouts’ or you can do your own Strength workouts if you’d rather. There will be a Super Lean Regime booklet available (coming soon) and a Super Lean Regime Training Plan , and a section which holds all of the resources you can print out for the 12 week period including weekly plans and cardio and strength workouts. And all of the links are here- About Super Lean. So, what do you think? 12 weeks from now you could be Super Lean, or leaner than you are now, you just need to choose to do the Super Lean Regime and do it. 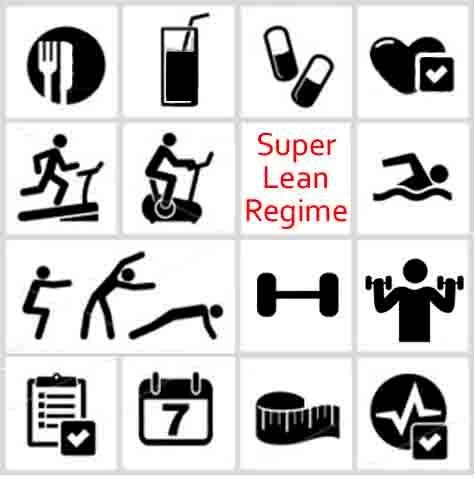 Are you ready to take on the challenge of the Super Lean Regime?